Experimente as vistas e sons de Budapeste em um passeio de quatro horas por bicicleta. Visite a Praça da Liberdade, a Ponte Margarida e muito mais. Você vai desfrutar da emoção de ver a cidade de bicicleta e não vai ficar desgastado graças ao motor elétrico. Seu guia está com você a cada passo do caminho para narrar o passeio e responder a perguntas. Do outro lado do rio, desfrute de uma pausa com bolo e café de cortesia antes de continuar o passeio. E Bikes are super easy and fun... this tour was great because we were able to make it to the top of Castle Hill. Good overview of the city and its history, nothing too intense. I would do this to begin your trip that way you have time to go back to any of the spots you are/were interested in. 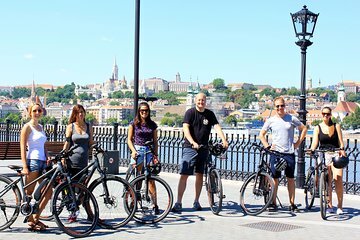 ebike tours are the way to go - you cover much more ground in the same amount of time without a ton of effort and can also get to places on the top of hills that you can't on a regular bike tour. This allows for some great photo opps. Our guide Sandor was informative and spent the right amount of time on history and local context. The website description has some inconsistencies - this is a 3.5 hour tour which is the right duration, however the website also says 5 hours and the stops don't match.